Le Grand Lanna - and it certainly was! There is something about the Lanna style which I find very attractive. It may be the extensive use of wood in the buildings, or the decorative features, but for me the design recaptures the “lost” Kingdom of Lan Na, where King Mengrai and his army reigned supreme. But then, of course, I am an incurable romantic! To cater for this unbridled romanticism we went to the (currently being developed) Dhara Dhevi Resort and Spa to have lunch at their Le Grand Lanna Restaurant. As you swing in through the gates you have just stepped back in time as you look at the teak wood buildings surrounding you. 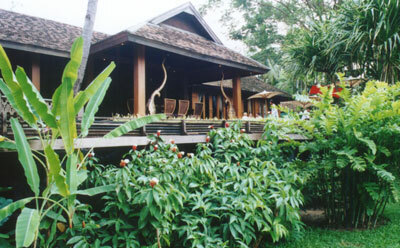 Walk through the lush green gardens around the pool and there is nothing to suggest to you that King Mengrai has long since gone. We chose the sumptuous Colonial room. All teak with two Garudas to look after us. Plus several waiters! 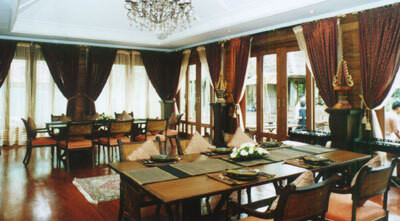 A large wooden table covered with Thai silk, hand wrought polished cutlery and hand painted Thai silk placemats. Even the water glasses were cut glass tumblers. We sat on large chairs, complete with an extra cushion for our backs. Our hostess was Khun Niramol Udomsilp and the Dining Out team is very appreciative of her efforts at short notice. One of those “nothing fazes” kind of people. The menu is extensive, beginning with Appetisers 100-280 baht including the traditional sai-oua (Chiang Mai pork and herb sausage) and running into the typical Lanna dips (B. 100-120), salads (B. 150-220) and soups (B. 120-280). From there it is into the curries (B. 120-350) including gaeng ga-ree gai, one of my favourites, and stir fries. There is one section covering rice or noodles with various dishes (B. 120-300) then a dedicated vegetarian menu (B. 100-150) and even a small selection of western items (but I wonder who would be so crass as to ask for fish and chips while dining Lan Na style)! 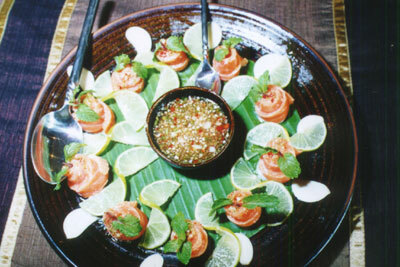 We began with fresh raw salmon tossed with lime, garlic and mint leaves, presented rolled up in cones on banana leaf. The presentation was superb and the taste exquisite. This was followed by several dishes and included a Chiang Mai curried pork, delicately flavoured with garlic and bean sprouts. This was one of my favourites and I backed up for more! The famous Chiang Mai sausage was also on our table, but watch the sauces if you are a little nervous of the total chilli experience! We also had the som tam farang (a guava salad with prawns and cashew nuts) which had a wonderfully ‘crunchy’ texture as well as the sharpness from the som tam. To complete our lunch we had a BBQ’d pork with a wonderful smoky flavour and a very meaty chicken and coconut soup. How do you sum up a meal served in circumstances that made you feel like one of the Royals? Served with such style that you felt like ‘wai-ing’ to the waiters in appreciation of their total dedication to you, the gourmet diner. It was dining in the ‘grand manner’ on food that was meticulously prepared and served in circumstances that took your breath away with its grandeur. If you are ever feeling down, then go for a meal at Le Grand Lanna - you will come to the end of the meal totally requited and feeling like royalty. The highest recommendation possible for this dining out experience. This is a place for special occasions or for taking overseas visitors to so that they can understand something of the culture of the North.